Two stolen statues have been returned to Rome, thanks partly to an Italian policeman who spotted one of them on sale in the US. The bronze statue of the Greek god Zeus and a marble female torso were stolen in the 1980s. Officials said the statues had ended up in the hands of a dealer and a collector in New York. 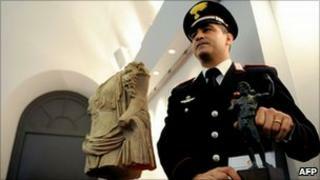 Carabinieri art squad officer Michele Speranza spotted the torso in a gallery while on holiday last year. At a press conference in Rome on Friday, he said he was walking down Madison Avenue in New York when he saw it. "I stopped to look at the gallery window and I recognised the statue," Mr Speranza told reporters. "I thought I had seen it among the photos in our databank". The officer took a picture of the torso on his mobile phone and looked it up when he returned to Italy. It had been stolen in 1988 from the archaeological museum in the town of Terracina, south of Rome. "The statue had been given up for lost," said Gen Pasquale Muggeo, head of the Carabinieri art division, which is renowned for tracking down artefacts stolen or illegally excavated from Italian soil. The small bronze Zeus was stolen from the National Museum in Rome in 1980 and was tracked to a New York collector after it was spotted in a 2006 Sotheby's catalogue. Its owner, an American woman, agreed to return it to Italy on a voluntary basis, according to the US Immigration and Customs Enforcement agency, who helped in the return of the artefacts. Officials say the pieces are each worth around 500,000 euros ($680,000; £425,000). No arrests have been made in either theft. Authorities said those who owned the statues were unaware of their illegal provenance.